Silhouette Papercut in a Traditional Frame. Beautiful anniversary or wedding gift! Love is all about finding that special someone you wish to spend the rest of your life with. Every love is unique to the two individual people. This love should be celebrated every day we are given the chance to enjoy it. We enjoy looking back on photographs made together on special occasions in our lives. Pictures tend to fade over time. There is, however, a beautiful way to preserve your favourite picture with our Silhouette Papercut. We take your picture and fashion it into a silhouette. Your names or any text are added to it, along with a special date of your choosing. This may be the date of your first kiss, first date, or any other date the couple chooses. 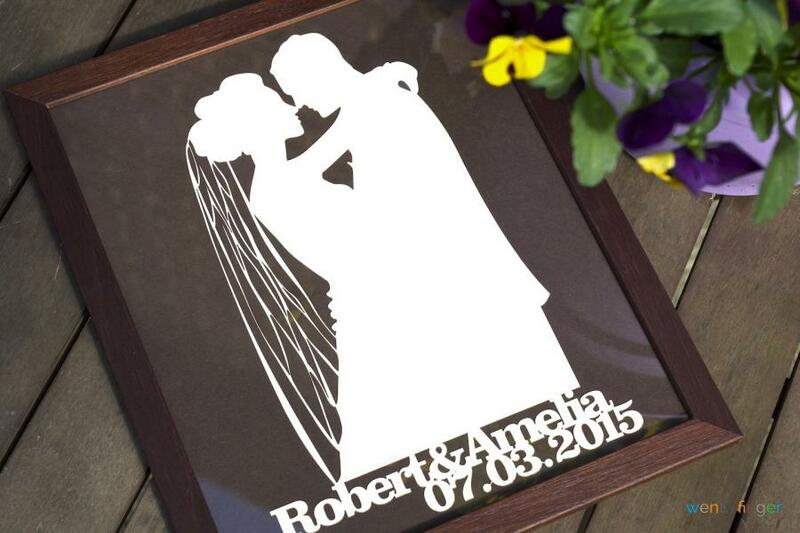 The Silhouette Papercut will be a memorable gift for years to come. What makes it so special? Perfect For all Occasions – Many gifts are only suited for certain occasions. The Silhouette Papercut can be given in any circumstance. Love deserves to be celebrated all year long. Unique – True uniqueness is very hard to come by. 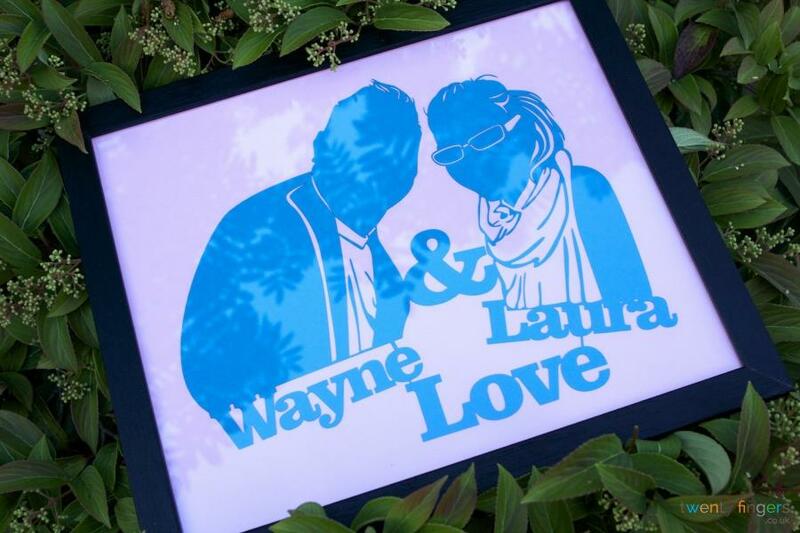 A Silhouette Papercut from us is a truly unique gift because it is fashioned from your photograph. No two will ever be exactly alike because there is no person that is exactly alike. Variety of Colours – Some gifts only come in one colour. That would be fine if we lived in a colourless world, but as humans, we crave colour. Our papercuts comes in a wide variety of colour to fit your personality and taste. Your Silhouette Papercut will be a work of art, but no work of art is worth quite as much without the proper frame. We offer two options to frame your papercut. Option one is for the traditionalist offered at this page - a handcrafted wooden frame. All frames can be customized to fit your papercut’s specific size. Option two is our most popular option. It is a floating frame. Your Silhouette Papercut will seem to float in the air. An unframed option is also available. 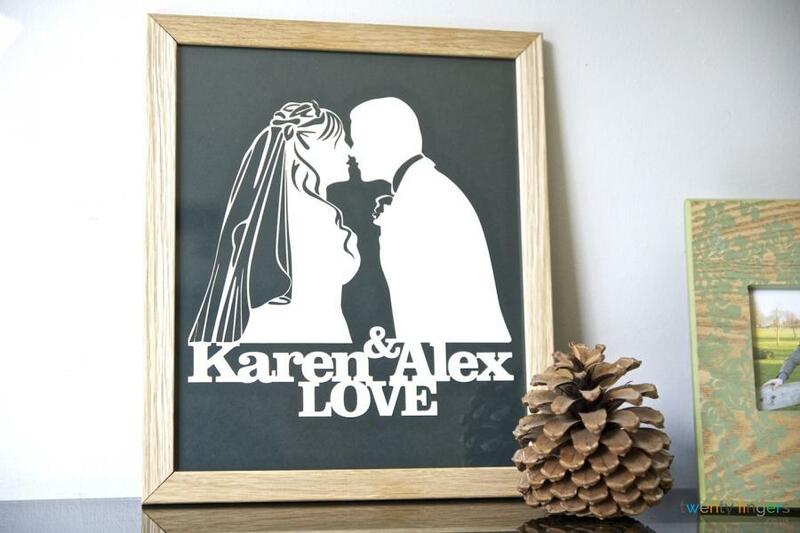 We send you your papercut in a size that will fit both A3 and A4 sized frames and you can frame it how you see fit. Delivery of your papercut has never been easier. It’s Free! 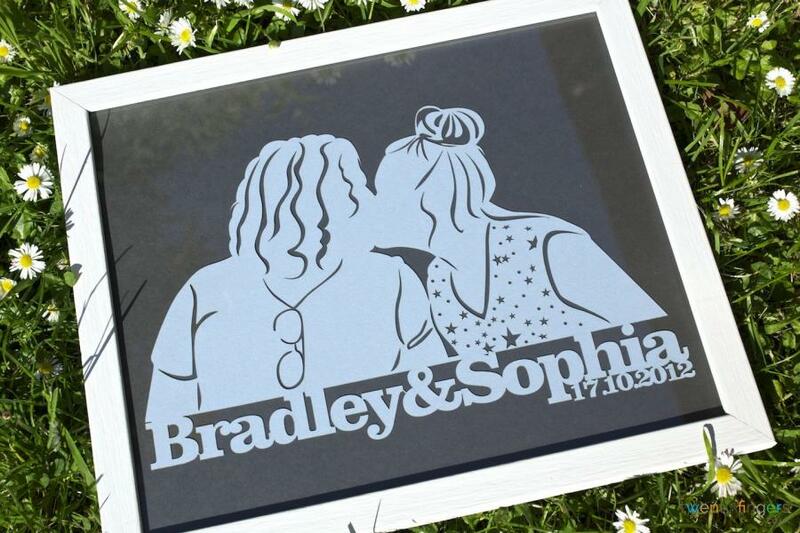 Within 2 to 3 days of completion of your order you will receive your Silhouette Papercut via Royal Mail 48 or myHermes tracked services. If you need your gift sooner, we can send it next day delivery with the use of Royal Mail Special Delivery or UPS Next Day service. We want our customers to have the freedom to choose. We at Twenty Fingers love to make beautiful gifts that will last a lifetime. 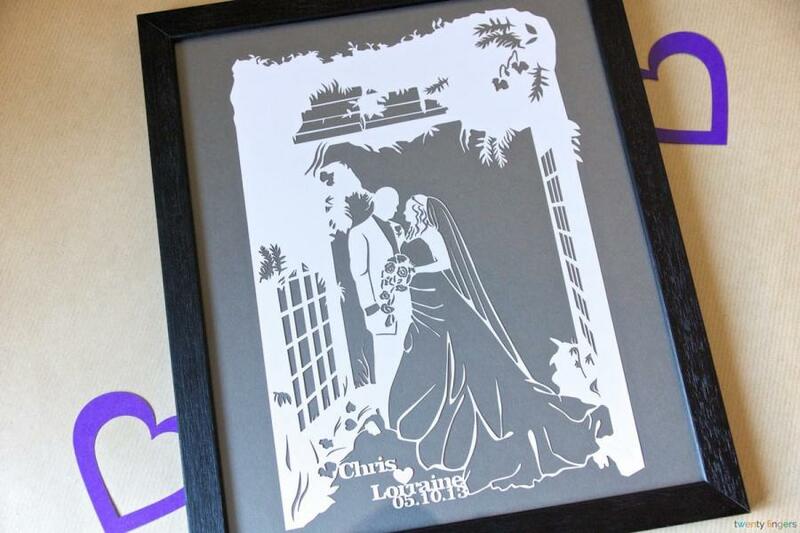 Our Silhouette Papercut is the perfect gift to last as long as your undying love. Purchase one for your love today and they will gaze upon it for a lifetime. I absolutely loved my photo and frame. I ordered it for my boyfriend as a valentines gift since its our first valentines and that is something to remember because it's very unique. Lana is very helpful and did everything what I ask for. I highly recommend twenty fingers to everyone so order yours you will not regret it!! Awesome product and fast delivery. Very happy with the quality and overall ordering experience.